Since the original ivory black is no longer available from sustainable politically correct sources, this mixture of Bone Black and Iron Oxide Black is the closest approximation to this historical color. Bone Black is a rich lustrous black which is quite transparent. In order to give this dark black some more hiding power, we have added the opaque Iron Oxide Black. 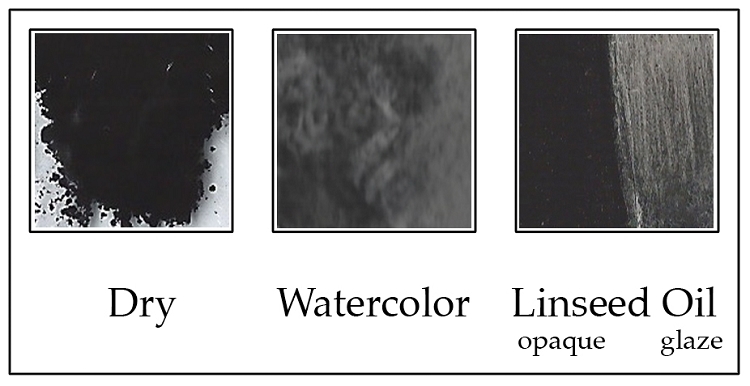 This yields a versatile, practical and semi-transparent black, which is suitable for all painting media. Q: Is this pigment non-toxic? What is the lightfast rating for this pigment? A: This pigment does not contain any heavy metals and is 100% lightfast.